One of my favorite memories from when Jake and I went to Europe is an odd little one - buying our breakfast from the stand in the U-bahn station every morning. We travelled to Germany during our spring break my junior (his senior) year. We travelled to Frankfurt (well, really Geisen) and stayed a few days with my family there. We traveled to Koln with my cousins, went into Frankfurt, and toured that area. After that, we ventured off on our own to Berlin. I was sort of torn as to whether to travel to Munich or Berlin but am glad we went to Berlin because experiencing the capital of Germany, a place with so much history, was a wonderful experience. When we were in Berlin, we were on a tight budget. I'd used my frequent flyer miles to get my ticket, bought Jake's ticket as a Christmas present, and we cut costs by staying with family and then in a hostel in Berlin. So we had to be very mindful of our money and one way we found to help with money was to buy breakfast from the stands so we wouldn't be as hungry at lunch. We'd buy a large bottle of water to share for the day and two crossaints. These stands were so cute - nestled in the U-Bahn (subway) station. I loved going there and getting our breakfast before hitting the pavement for the day. Since being back in America, I haven't found a decent crossaint. Not like those there- they were flaky, buttery, but not overpowering in either manner. That has since changed. 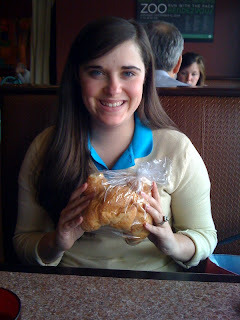 Last week, while at our favorite neighborhood spot Cafe Eclectic, I bought day-old crossaints from their day-old basket. For the next two mornings, I had the pleasure of reliving Berlin through my gastric sense of memory by ingesting the soft, chewy but flaky, just-right butteryness of their crossaints. For someone who doesn't even like breakfast, this was a great find. ps - Jake took this with his iphone and our waitress walked up as we were taking the picture. She thought we were CRAZY or just weird.